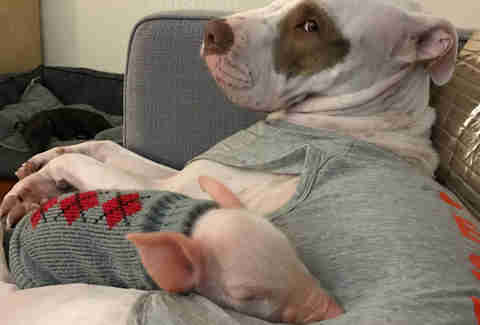 Pikelet and Patty Cakes are two rescue pit bulls from Australia who always have a TON of foster siblings. 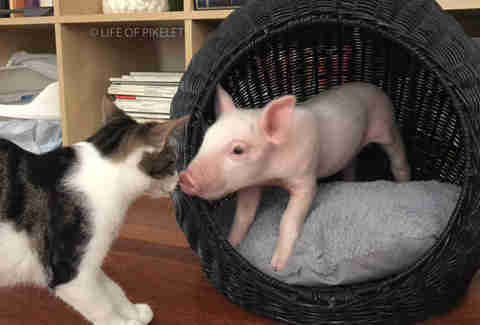 They’ve helped care for puppies, kittens, a piglet and even ducklings — but now their parents have taken on two puppies, two kittens and a piglet all at once, and things in their house are more adorably chaotic than ever before. The pit bull brothers, along with their other two forever siblings, Blanche and Betty, are incredibly familiar with welcoming fosters into their home, but their current fosters certainly make up one of the most unique crews they’ve ever had. 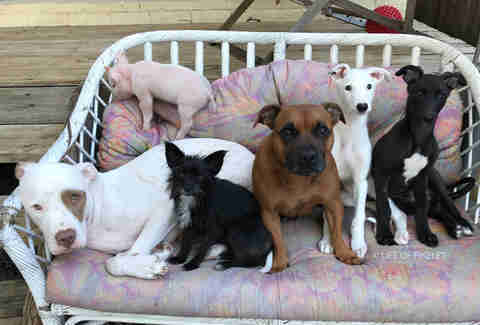 First the kittens arrived, then the puppies, and finally the little piglet, and amazingly, this temporary family of nine all get along wonderfully. 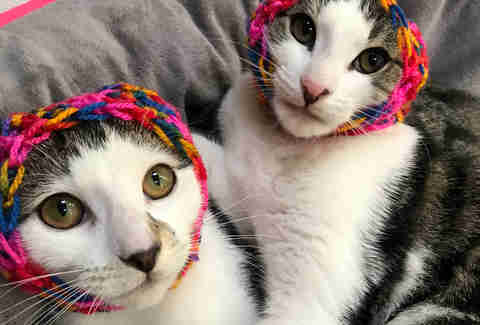 The kittens, Peppercorn and Peppergrass (along with their sister Pepperoni, who has since been adopted), were rescued by Wollongong Animal Rescue Network (WARN) when they were just 3 weeks old and have been with their foster family since they were 7 weeks old. 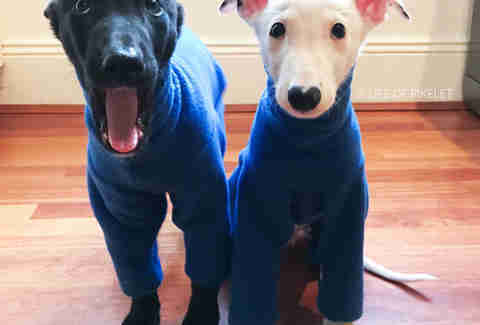 They’ve been in love with all of their doggie foster siblings since day one, and shortly after they arrived, the greyhound puppies, Pringle and Pretzel, joined the family too. The puppies were also rescued by WARN and joined their foster family when they were 7 weeks old. They’re so in love with their entire foster family, and love to snuggle and play with each and every one of them — especially once Pillow finally joined the family. 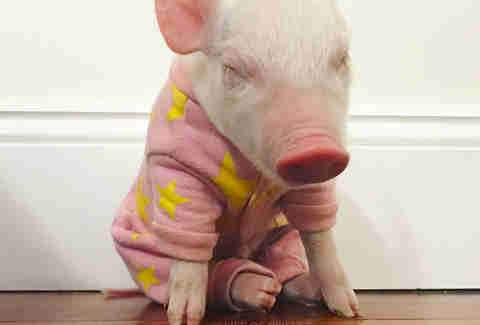 Pillow the piglet was rescued from a farmer who had too many pregnant pigs, and was planning on selling the piglets to be slaughtered for meat. 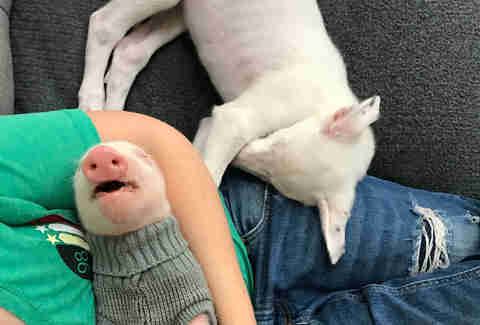 Calley and her husband were contacted by a neighbor who heard about the piglet’s plight, and the couple knew they had to step up to help. 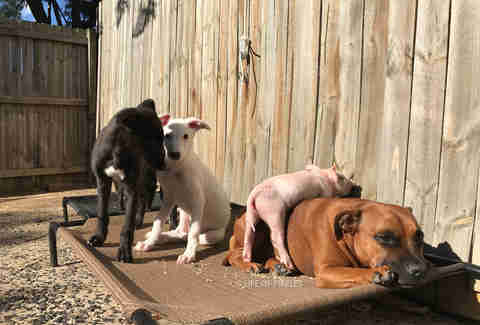 The older dogs were very unfazed by Pillow’s arrival, since they’re used to strange foster siblings joining their family. But the puppies and kittens were immediately fascinated, and it wasn’t long before they were all best friends with tiny Pillow. … who loves her big dog siblings right back. 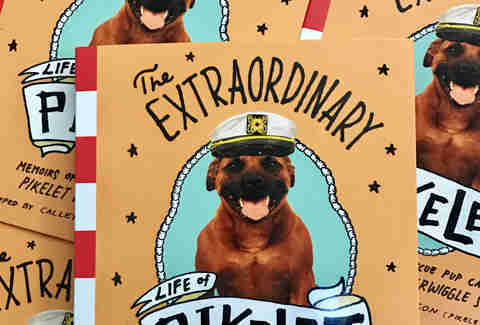 Pikelet is the original dog in the family, and has had so many siblings come in and out of his life that his mom decided to write a book to share their incredible story with the entire world. Pikelet also has a very popular Instagram account, where he and his mom share pictures of their big, happy family. “The book is essentially Pikelet's life story, it tells all the stories about each and every foster animal and their foster care journey here with us,” Calley said. 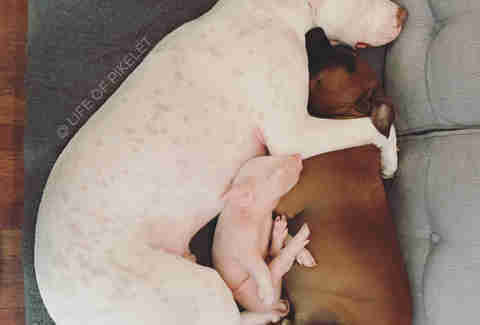 Four dogs, two puppies, two kittens and a piglet might seem like a strange group, but not to this family. 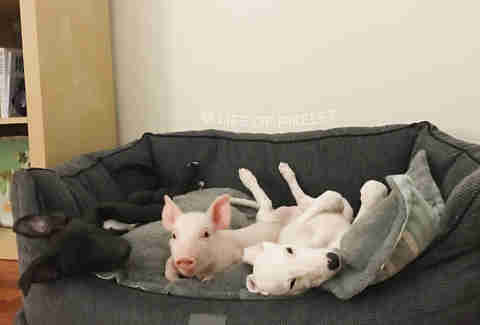 Despite their differences, they all get along wonderfully, and the older dogs are happy to help raise their baby foster siblings until the time comes for them to finally head off to the loving forever homes they deserve. You can follow this big, happy family on Pikelet’s Instagram account.